Camp by the lake at one of three campgrounds located in this 3,644-acre park that straddles Burke and McDowell County. The Catawba River area, the Paddy’s Creek area, and the remote, boat-in campground on the Long Arm Peninsula offers a true outdoor adventure for those willing to paddle or steer their canoes, kayaks or powerboats to their own slice of heaven. Located in the Appalachian district of the Pisgah National Forest is this campground that borders the South Toe River. Enjoy swimming, trout fishing, or tubing in the river and explore the area’s many hiking paths. All of this is within a short drive of Asheville and the Mount Mitchell State Park. Get sweeping views of the surrounding mountains and downtown Asheville atop a 100-acre bald in Madison County. Campers will enjoy the seclusion of the surrounding land, which has been untouched by man or machine for over seven generations. Located ten minutes outside of Asheville, this campground borders the 6,000-acre Bent Creek Experimental Forest. Hike along the nearby trails or take a dip in Lake Powhatan. Enjoy the fun of camping while still having access to restrooms with hot showers and flush toilets. A few sites have full hookups. If camping in the Blue Ridge Mountains means hiking, biking, and fishing, then this secluded campground has exactly what you want. This site is located within a short walk from the cool waters of North Mills River and offers easy access to Asheville and Hendersonville. Located along the banks for South Toe River, these campgrounds are perfect for exploring the Pisgah National Forest. 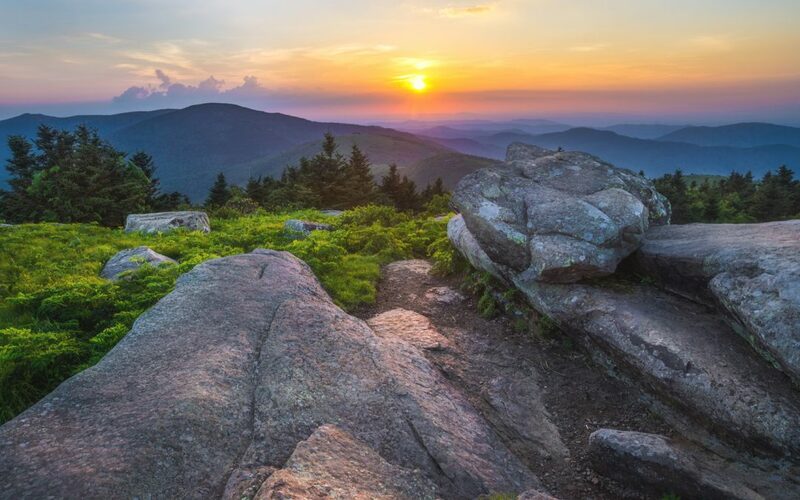 Spend a day tubing or kayaking down the river or hike to the top of Mount Mitchell, the highest mountain peak east of the Mississippi. If “roughing it” for you means sleeping in a cabin, then there are plenty of options at the Equestrian Center in Tryon. A perfect basecamp if you’re traveling for one of the center’s many equestrian events, there are log cabins, RV pads with full hookups, and even tiny houses available for rent. Located in Spruce Pine near Linville Falls and Linville Gorge is this 400-acre campground and cabin rental site. Every campsite has amenities including water, electric, fire rings, and picnic tables, and there are facilities available that include hot showers, washers, and dryers. RV’s up to 45 feet can be accommodated. Camp out alongside the Davidson River located a few miles from Brevard and about 45 minutes from Asheville. This area is considered one of the best for trout fishing and waterfall hunting. From here you can also quickly access some of the area’s iconic hikes along the Art Loeb and North Slope Trails.